As protectors of the environment, we seem to spend most of our time fighting against dangerous proposals. From trash-burning incinerators to crude oil train terminals, the resources at Baltimore's port seem to attract some of the worst examples of failed development. But last night was an incredible opportunity to stand up for the kind of investment in infrastructure we do want to see in Baltimore: infrastructure that cleans our air, fights climate change, and brings good, stable industry and high-paying jobs back to Sparrow's Point. Last night the Public Service Commission held its second hearing on offshore wind, and every single person in attendance supported this opportunity. I drove to the hearing with several members of one of our partner organizations, United Workers, who felt it was important to speak out on offshore wind as a human rights issue. Qeisha shared her memories of her own grandfather working at Bethlehem Steel, the impacts that both the economic opportunity and the industrial pollution had on her family, and her dream that her daughter could have the choice to work in the offshore wind industry. 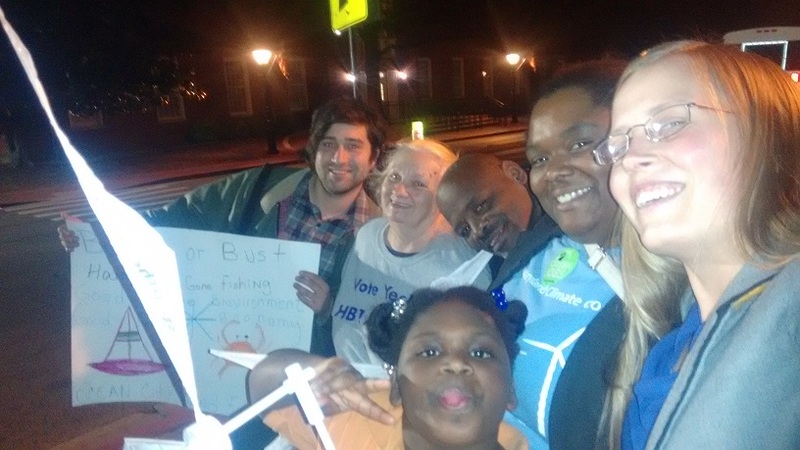 Sidney shared about his struggles with asthma and other resperatory conditions, and his hopes that investing in offshore wind would help clean Baltimore's air. And Debra spoke about United Workers' campaigns against trash incineration, which currently receives the same public subsidies as offshore wind in Maryland by being classified as "renewable energy." Offshore wind presents the opportunity for Maryland to invest in truly fair development that will benefit Baltimore workers, businesses, and air and water for decades to come. Sixty-seven people spoke in total, and every single one of them supported offshore wind. Some spoke about the jobs and economic impact of the project on Baltimore and the Eastern Shore; some spoke about air quality and their struggles with asthma; some shared their fears that their homes and favorite places throughout Maryland will be lost to sea level rise from climate change. Some even sang songs and recited poetry! All together, we sent an undeniable message to the Public Service Commission: Maryland needs to think big on offshore wind! It's not too late to submit written comments to the PSC, so please sign our comment letter and share it on Facebook and Twitter. It's time to think big on offshore wind and make Maryland a leader in green jobs! Good evening. My name is Jennifer Kunze, and I’m a lifelong Maryland resident. 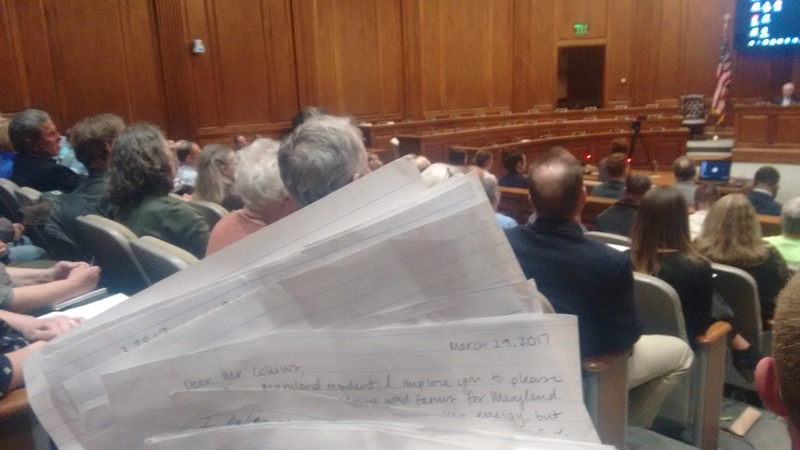 I volunteered to help support the legislation that got the offshore wind process started when I was in college, and I now live in Baltimore City. I’m also the Maryland Program Organizer for Clean Water Action, a grassroots environmental nonprofit with over 50,000 members in Maryland. On behalf of those members, we urge you to think big on offshore wind in this case and approve the largest offshore wind farm proposal before you. I have with me a few of the over 200 comments our members have written urging you to make Maryland a national leader in this growing industry. Offshore wind has the potential to bring enormous economic benefits to Maryland and to the Baltimore area and the Eastern Shore in particular, but only if we think big and seize our place as leaders in the industry. Where I and 11,000 of our members live in Baltimore, we experience acute air quality effects from dirty energy. The Baltimore area has long failed to meet federal health-based air quality standards for ground-level ozone and failed to meet standards for fine particulate pollution until 2014. The negative economic impacts of this pollution in healthcare costs and missed work cannot be overstated, not to mention the human impacts of illness and premature death. Moving our state toward clean energy by building offshore wind will help clean Maryland’s air and bring enormous economic benefits in the improved health of our residents. Offshore wind also creates an opportunity to make sure that the money Maryland residents are already paying to clean up our air are creating good local jobs in Maryland. Our state’s RPS currently provides Tier 1 renewable incentives primarily to out-of-state energy sources, creating jobs there but not in Maryland. Within Maryland, over 40% of the renewable energy credits generated are from burning trash, which creates a great deal of air pollution that harms our residents. Offshore wind represents an opportunity to direct more of these resources toward a truly clean energy source that will also generate long-term, high-paying jobs in Maryland. The U.S. Department of Energy has found that jobs associated with the offshore wind industry have average annual earnings (including benefits) of $140,000 with supply chain job holders earning an estimated $70,000 annually and induced jobs providing approximately $50,000. Thinking big on offshore wind could bring up to 5,000 of these jobs to areas of Baltimore and the Eastern Shore that need them most, providing cascading economic benefits to our residents. These jobs would have incredible economic benefits to Baltimore and the Eastern Shore. The offshore wind industry is about to take off, and other states are seeking this “first mover” advantage that’s before Maryland right now. The Port of Baltimore is an excellent and powerful economic engine for our state, with excellent deep water access and large areas open for development on the Sparrows Point and Fairfield Peninsulas, and it should become the East Coast hub for offshore wind development as other states follow Maryland’s lead. U. S. Wind’s proposal to construct an offshore wind turbine manufacturing and assembly plant at Sparrow’s Point in particular, where Bethlehem Steel once employed thousands of Baltimoreans, would make Baltimore the first US city with the ability to manufacture parts for offshore wind turbines at a large scale, cementing our place of economic leadership in this growing industry and attracting more offshore wind businesses to locate here as the industry grows. What Baltimore city needs to fight back against the negative health impacts of air pollution and what the eastern shore needs to fight back against the dire threat of sea level rise is within each region’s grasp, it’s just up to you to allow us to take it and become the leaders in green energy we deserve to be. Personally, I can’t wait to visit Ocean City, patronize local businesses, and see the beautiful sight of offshore wind turbines on the horizon in a few years, and I know I’m not alone. If Maryland is truly open for business as the governor promises, we will embrace the economic benefits of offshore wind by taking this enormous opportunity to attract these businesses to Maryland and employ our residents in good, accessible, high-paying jobs. We ask that the Commissioners take a particularly close look at approving the larger U.S. Wind farm proposal, which would increase Maryland’s chances of claiming the “first mover” advantage and could help Baltimore City and all of Maryland take a critical step toward revitalizing our economy. Thank you for your consideration of these comments. Join our email list to stay in the loop on clean water issues affecting your region.